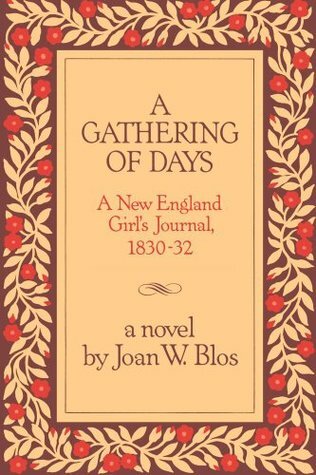 From 1830 to 1832, Catherine Cabot Hill keeps a diary about the daily events of her life in New England, an account which she later passes on to her great-granddaughter. Diary entries cover everything from attendance at the one-room schoolhouse and keeping the Sabbath, to assisting an escaped slave, saying goodbye to a best friend, and adjusting to the arrival of a new stepmother. Like The Light in the Forest, this is a book I remember loving in middle school. Though diary fiction is so popular now, there were fewer books in that format when I was a kid, and I was always fascinated with them. I remember enjoying this and Nothing But the Truth by Avi both because of their documentary format. However, as with The Light in the Forest, my memories of A Gathering of Days were not at all accurate. For one thing, I was sure this book was a romance novel, and it decidedly is not. I admit, it would have been odd for my seventh grade English teacher to assign a romance, but somehow that has not stopped me from re-imagining the book as such over the years. I also remembered the story being very easy to read, which led me to remember the language as contemporary-sounding. It turns out that the language is actually a lot more dense, and more beautiful, than my twelve-year-old self was apparently able to appreciate. It reads much more like the Newbery winner it is than I expected. Unlike My Brother Sam is Dead, which is intentionally written in 1970s parlance to make the story more accessible, A Gathering of Days reads like a diary written during the 1830s, with all the formalities of usage and syntax that would have been common for teens of the time. A Gathering of Days is a nice introduction to everyday American living in the early 19th century. I think students often spend a lot of time learning about the Civil War, but not as much exploring how the average person lived during the more peaceful parts of the 19th century. Historical events do affect the characters in this book, but they do so in the same way the news of our day affects us - it happens, we deal with it, and we continue living our lives. Though slaves escape and girls leave home to work in factories, Catherine is more concerned with the ailments of her best friend, and the introduction of a stepmother into her home. The fact that Catherine is such a relatable character with thoughts and emotions similar to young teens of the 21st century might encourage even reluctant readers of historical fiction to give this story a chance. As a history lesson on its own, this book would be rather thin, but as an introduction to the time period, or supplemental reading to emphasize what it was truly like to live in New England during the 1830s, it is a must-read. Though the time periods are quite different, this book actually makes a perfect read-alike for Catherine, Called Birdy, and for Sondok, Princess of the Moon and Stars, because all three books allow the reader to get to know a historical time period through the specific thoughts and feelings of one very sympathetic protagonist.